Whether resembling swimming lanes or crop circles, the Sixers shooting guard's corn rows are arguably the best-known locks in the league. Like his tattoos, Ivy's hair speaks to the energy and creativity he possesses on the court. Allen Iverson first wore cornrows during the Schick Rookie Challenge in 1997. He was the first player who wore them and eventually set a trend that Latrell Sprewell and Rasheed Wallace would follow. After the game he was asked about his new hairstyle. He told the media, "I'm going to keep it like this until I'm finished playing basketball. I won't cut my hair anymore. I don't think I'm going to keep the head band, but I'll keep it like this. I guess I just get tired of getting haircuts on the road, things like that, when I can just get a girl to braid it and it will stay done for a while." Allen continues to wear cornrows until today. He clearly set a fashion trend in the NBA that many young athletes would follow. His styles are unlimited and once in while you'll find a new surprise. Click here to read an article on AI's hairstyles and his stylist. During Allen's very first year at Georgetown, this was the style he sported. No braids, no hair at all. It's kinda weird to see these old pics from Allen's college days. Personally, I prefer the rows, but as always, Allen looks good. Before Allen decided to devote himself to cornrows, he used to wear his hair like this. This hairstyle was worn by Allen way back in his Georgetown years and a first half of his rookie season with the Sixers. The hair are shaved on the sides, and just a bit are left on top of the head. This is the most common hair style in the NBA and colleges, but most likely Allen will never be coming back to this one. This haircut is a smaller version of afro, but smaller amount of hair left on the head. The top has plenty of hair, while the sides have a bit shorter cut than the top does. Yet another cut which Allen most likely not to have again. This hairstyle features whole lot of hair on your head. Basically it is a larger version of mini afro, but there is much more hair. This haircut was very popular in NBA during 1970-1980. Only once has Allen posed like this, with his braids out and with a Dr.J-like afro. It was when he was in the old school issue of SLAM. 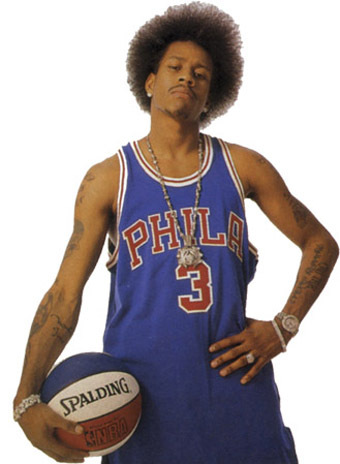 Allen has said that he wants to wear his hair like this when the Allstar game is in Philly in 2002. Different and cool. Allen's first cornrows. Allen put'em in sometime before the Allstar-break in 1997, and has never ever taken'em out again. Many, tight and straight in line from his forehead to his neck. A bit boring maybe. This style is the way "regular" cornrows look nine out of ten times. Iverson was the first player in the league to have this hairstyle. The hair are braided in tight lines. Many other player such as Latrell Sprewell, Rasheed Wallace and many more have copied this hair style from Allen, but i just want to let you know that Iverson was the first one to have it. Allen wore this particular hairstyle during the off-season in 98 at his celebrity tournament in Hampton. The hair are braided in trianglelike lines which go up and down. This one is one of the most traditional and also one of the most popular. Allen wears this style a lot. A style rarely worn by Allen, but indeed one of the coolest ones. This one has six rows in no particular wave or shape, but with cool "+" symbols in the rows. A new-school look that adds something to the boring straight line rows. Allen has worn other "versions" of this look, with various patterns "on top" of the basic rows. As you can see from the picture, the braids have little crosses or x's cutout inside them. Looks a lot like many of the others - tight rows, from forehead to neck in a wavy style. A newer version of the original tight line rows. Cool, but I like the newest ones a lot more than this one, which is kinda conservative. Large rows in no particular style, just the usual look. This style, together with the other rows that are traditional in-line rows are made by Tawanna, Allen's fiancee. 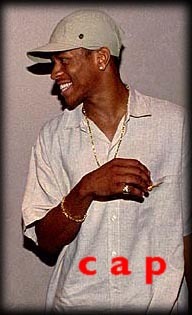 This is the most common style worn by Allen Iverson. The hair is braided in lines. Allen started wearing braids since his second year in the league. The only braided hairstyle he has worn before this one were the tight line braids in his first year. Probably my personal favourite. Again, hair stylist Dionne Matthews has added something to the rows, without changing their straight line from the forehead to the neck. Really great, playoff-style. The rows look a bit large. Allen wore this style early in 98 and late in 99. Hair are braided in wide lines, so there are about 3-4 lines at all. The rows are expanding in size in a wavy style as they head for Allen's neck. Then, in the back of Allen's head, they contract again, and from there on down, they are regular straight line rows. Allen wore this style a lot in his fourth NBA season, especially in the playoffs. This one is kinda different. Instead of going from Allen's forehead to his neck, the braids this time go from the middle, heading down the sides of his head. Rarely worn, but cool. In this hairstyle the braids start from the center of the head and the line works its way down in the opposite directions. Iverson hasn't worn this hairstyle much, he has only had it for a couple of games this year. I've only seen Allen wear this one once, but it's definitely one of my favourites. It's a lot cooler than the regular straight line rows. Adding waves to all of Allen's different cornrows-patterns really make'em a lot cooler. This was the style Allen has worn more and more during the final months of his second year in league. Another one that I really like. This time, the rows are expanding from small to large as they make their way all the way down to Allen's neck. Wearing this style, Allen looks like he's, you know, always heading forward quickly. Which, in fact, he is. Allen debuted this style late this season and in the playoffs. It looks a lot like the two styles below, but is a bit different. Each row has a center line with tighter rows along it. Really cool. Worn in the playoffs this year, this style features lots of tight, thin rows going from one side to the other on Allen's, only interrupted by one thick row on each side and a "split" on top. Bad explaination, check the picture instead. This one looks a lot like the one above, but this time the thin rows go from his forehead to his neck, interrupted by thick rows heading in no particular pattern. One of my personal favourites. WHAT DOES ALLEN LIKE TO WEAR WHEN HIS HAIR ISN'T IN STYLE? Whenever Allen's hair hasn't been braided in a while and looks a bit "worn out", Allen puts on a skullcap to protect them and to still look good. Rumors have it that Allen doesn't like to be photographed when his braids aren't fresh and in style. He also wore a skullcap when receiving the 1997 NBA Rookie of the year award, which he took a lot of heat for. Weird, considering that Allen looks daaaamn good with a skullcap on his head. It's quite obvious that Allen loves to wear headbands. During his first NBA season he wore black and white headbands and earlier this year he wore a black one with a white "13" on in honor of Wilt Chamberlain. 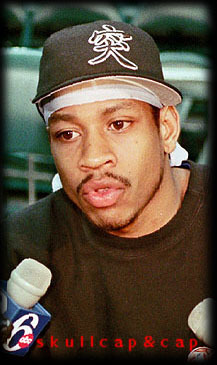 Iverson has several times been seen offcourt sporting a headband, which underlines the fact that he really likes wearing'em. I just wish Allen wore headbands more often, cuz he looks really cool in'em. To the right, my most recent pic of him wearing a headband, from the playoffs 2000 when Allen wore a Phat Farm headband. A popular style among rappers - to wear a skullcap or a headband under a baseball cap. Iverson has been seen sporting this style a lot lately (as of spring 2000) and has worn this during several press-conferences after games and he also wore a skullcap and a cap when meeting Toni Kukoc for the first time in Philly at a press-conference. 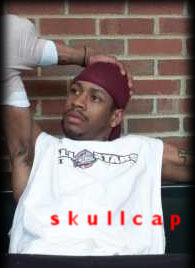 The pic to the right is from the playoffs 2000 as Iverson sports a cool cap and a skullcap when talking to the press. The pic at the right is from Allen's first NBA season, and it's quite obvious that his style has changed dramatically since then. He has started wearing more jewelry, grown, gotten more tattoos and ditched the cap for skullcaps and headbands. Nevertheless, I really fancy this style, as Allen wears a cap that matches his shirt. By the time Allen wore this cap, he hadn't yet started sporting the cornrows. 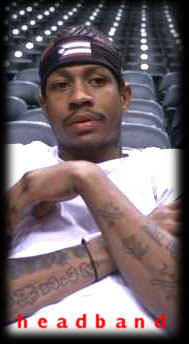 Copyright © by Allen Iverson Live - www.alleniversonlive.com - A Fan Site on NBA Legend Allen Iverson All Right Reserved.